Jade Plant, pictured above, is a beautiful succulent that requires very little water (it can live up to a month without being watered). It is tolerant of a little shade, but will do better if placed next to a window. 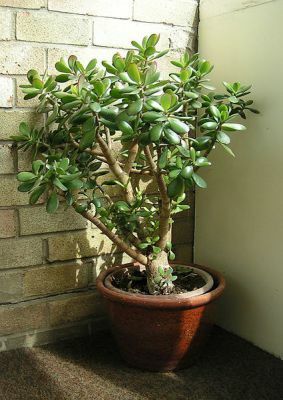 If grown under particular conditions, Jade plant may produce small white or pink leaves. 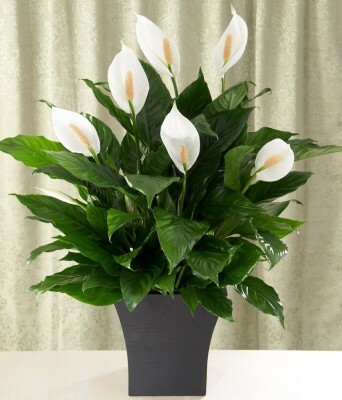 The Peace Lily is probably the most elegant of the hardy houseplants. It has white flowers with long, dark leaves, and does not require very much sun; yellowish leaves may indicate that the plant is receiving more sunlight than necessary. The plant will do best if placed within 6 to 8 feet of a window. If the leaves begin to droop, it may need more water; make sure the soil dries out between waterings. It topped NASA’s list for removing all three of the most common volatile pollutants — formaldehyde, benzene and trichloroethylene. It can also combat toluene and xylene. This striking plant is one of the easiest flowering plants to maintain. When watering African Violets use a long-spouted watering can to reach the soil to avoid getting cold water on the plants. A common mistake is to overwater them or even water them with cold water. Water which is too cold prevents growth, causes leaf spots and possible color changes. It's best to water them when the surface of the soil becomes slightly dry. Any excess water which accumulates at the bottom of a pot should be removed. A fast draining soil mix is best to use. I recommend using African Violet soil mix because it's cheap and easy to obtain. These plants prefer high humidity and an occasional gentle misting to maintain healthy growth and to produce abundant blooms. You can use a humidity tray to create the correct levels of moisture that they need by placing a layer of small pebbles or gravel into a dish placed under the pot and keeping it damp. 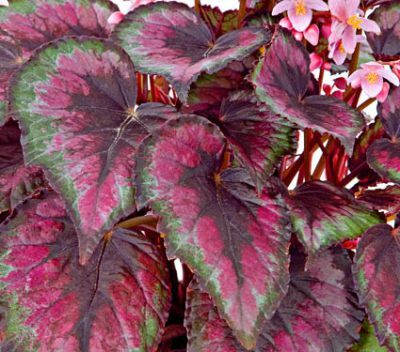 Unlike many begonias, the Rex Begonia is known for the beauty of its foliage. The leaves have a painted appearance to them, and some feature interesting textures or irregular leaf margins as well, with leaves which grow up to six inches. Begonias should be placed somewhere where they will get bright, indirect light and plenty of humidity. If the air in your house is dry, especially in the winter, it is a good idea to set your begonia houseplants on a shallow tray filled with pebbles and water. This will allow them to get the humidity they need, indoors, without waterlogging the soil or exposing the leaves to moisture that could cause fungal disease. Begonias grown indoors are especially susceptible to overwatering. Make sure that you only water them when necessary. It is recommended to wait until the plant's leaves droop, before you water them to help prevent accidental overwatering, which is the main cause of death for begonias grown indoors. When watering your begonias, make sure to water below the leaves in order to prevent fungal disease. Rex Begonias make great potted plants and work well in extra-large containers or raised gardens in and around your home or office where other plants won't grow, since they can handle neglect. 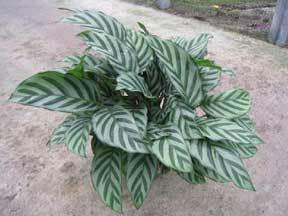 Calathea concinna, sometimes called Concinna Prayer plant, makes a handsome addition to any room in your house. Concinna Prayer Plant has a combination of light green and dark green leaves in a palm-like form. Calathea concinna repeatedly displays white flower blooms throughout the year. This plant requires constant water. Never let the soil dry out much between waterings. This plant requires constant water. Never let the soil dry out between waterings (a self-watering pot is recommended). The genus Calathea includes some of the most beautiful and striking tropical foliage plants in the world. They generally have boldly marked, upright, oblong leaves in a dazzling array of colors held on long, upright stalks. There are a number of varieties available. Colors can include yellow, rose, white, and even olive. 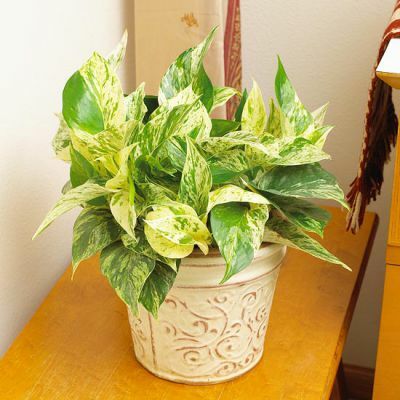 Each one also has a different leaf pattern of colorful spots or blotches. They are true tropical plants and need at least 55 degrees to survive. This plant provides great color even when grown in preferred low-light conditions (avoid direct sunlight). They usually grow between 6-24 inches tall. 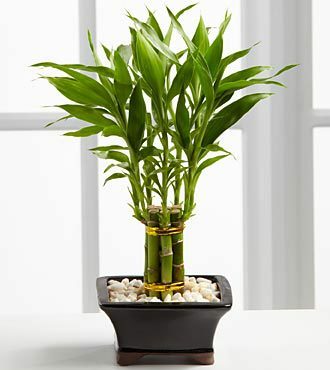 According to Feng Shui followers, Lucky Bamboo brings peace, strength, and luck to the homes it inhabits. Additionally, it is one of the easiest plants to maintain! When growing in water (or a water and gravel mix) change the water once every two weeks. The water level should be at least a couple of inches. Add water to make sure the roots stay covered. Every couple of weeks change the water completely with fresh clean water. Lucky Bamboo is sensitive to the salts and chemicals in tap water so use distilled water or rainwater if possible. If you must use tap water let it sit in an open container overnight; this will let the chlorine evaporate. Every couple of months fertilize using either some dirty aquarium water or a 10% solution of water-soluble houseplant fertilizer. When growing Lucky Bamboo in soil; the soil should be kept moderately moist. The soil should not be soggy or dry. To determine it's water needs; stick your finger in the soil up to your first knuckle (about an inch deep). If the soil feels dry, it is time to water. It is very important for lucky bamboo to have good drainage when planted in soil (a cactus mix would be good for achieving this). Lucky Bamboo will grow best in bright indirect light. While this showy shrub survives in low light levels, its foliage shows the best color in bright spots. Its gold, pink, and orange tones glow when back-lit from a sunny window. Mist and wipe the leaves occasionally to maintain their shine and keep it looking sharp. 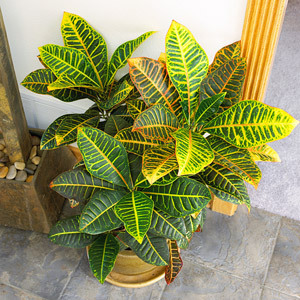 It has beautiful, leathery leaves with exotic and colorful markings. It prefers bright light and temperatures above 60 degrees F. Allow the soil surface to dry between waterings. It grows to 4 feet tall and 3 feet wide. Note that this plant is poisonous and can make children or pets sick if they chew on it or eat it. 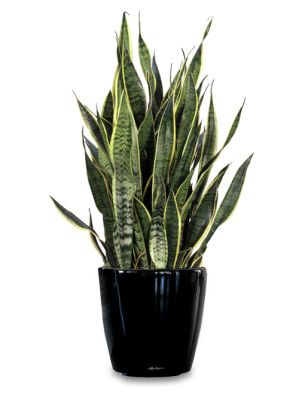 Also known as Mother-in-Law’s Tongue or Saint George’s Sword, this plant is one of the best for filtering out formaldehyde, which is common in cleaning products, toilet paper, tissues and personal care products. Put one in your bathroom — it’ll thrive with low light and steamy humid conditions while helping filter out air pollutants. Named for its long, sharply shaped leaves, this plant with its strong, elongated leaves is incredibly tough. Mother in Law’s Tongue converts CO2 at night (so it is also suggested that it be placed in a bedroom). It prefers sun, but it is a very forgiving plant and will tolerate shade. Let the soil dry between watering, and err on the side of dryness. An old-fashioned classic, rubber tree gets its name from the sticky, milky sap it exudes if injured. It eventually grows into a large tree, but you can easily keep it shorter by pruning back long stems, causing it to branch into a multi-stemmed shrub. The older plants get, the larger they become -- a good-sized rubber tree makes a big, dramatic accent in any room. 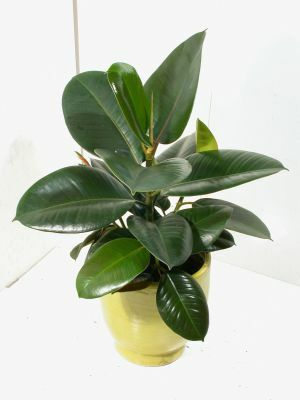 When it comes to rubber plant care, it needs bright light but indirect light. Some people recommend putting it near a window that has sheer curtains or a north facing window. Allow the soil surface to dry between waterings. It is also a good idea to wipe off the leaves of your rubber tree plant ocassionally with a damp cloth or spritz it with water to keep it looking its best. Fiddle leaf fig are loved for their large, glossy, leathery leaves. They make great houseplants. They are fantastic as larger specimen plants — in a large container, they can easily grow to around 7 feet tall. Place fiddle leaf fig near a window that gets bright filtered light. Keep it away from harsh direct sunlight to prevent leaf burn. Since it comes from a tropical climate, most experts advise keeping this ficus steadily moist and in a warm room, if possible, but do not allow it to sit in too much water, or it can suffer from root rot. These quirky looking plants are members of the pineapple family. Guzmania bromeliads make wonderfully stunning tabletop plants. They feature long, narrow, shiny green leaves that rise from a deep central cup. The plants are somewhat taller than many bromeliads. Their large and showy flower bracts arise in the summer in an amazing array of colors. Guzmania are not difficult bromeliads to grow, and they will reward you with many weeks of color with little or no effort. They prefer indirect light or moderate shade. Do not expose to direct sunlight. Always keep water in the central cup. Change water frequently with clean water to prevent rot. Avoid tap water if possible. During colder weather, they can be watered lightly in the soil, with a dry cup. Aim for a temperature at least 55ºF or higher. 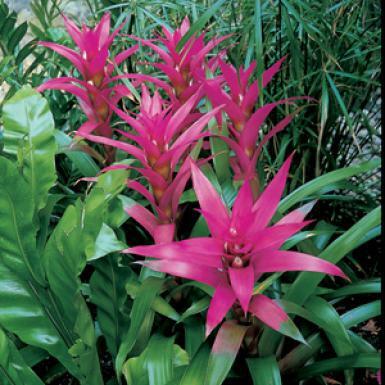 These are warm-house bromeliads that appreciate high humidity and warmth. These are technically airplants that use their roots for support. They are grown for their beautiful inflorescence (the flowering part of the plant) that remains for many months. 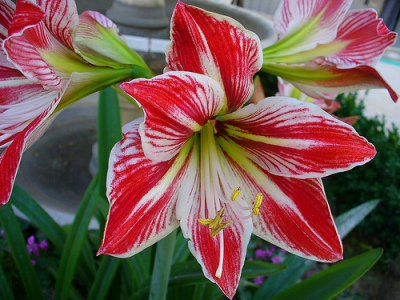 Amaryllis is an easy indoor plant to grow from bulbs. Its enormous cluster of trumpet-shape blooms may require staking to keep them upright, but blooms may last for up to 6 weeks. Keep the plant cool (60-65 degrees F) while in bloom but slightly warmer at other times when it is actively growing. It needs bright light and evenly moist soil, except when it is dormant. Force the bulb to go dormant in late summer or early fall by withholding water and placing it in a cool, dry location for a couple of months. Resume watering and move it to a warm spot to force new growth. They usually grow from a height of 1 to 3 feet to a width of about 1 foot. Flower color range from Pink to Red to White. These plants feature both Spring blooms and Winter blooms depending upon how much water they are given. They are popularly considered to be low maintenance houseplants. This relative of the amaryllis is also grown from a bulb and like it's cousin, needs to be pot bound to flower, however, repot them when you see the roots pushing out of the top of the pot. Also like the amaryllis, Clivia go through a dormant period before growing a flower stalk. Flowers are usually some shade of brilliant orange. They grow wild in South Africa and their common name is Bush Lily. The soft, yellow shade of the 'Good Hope' cultivar makes this durable plant an absolute knockout. Clivias thrive in bright light or even in indirect light (such as a north window) and require very little care, growing larger and more impressive with age. Water them when the soil feels dry. Withhold water during the plants rest period (usually around November) and resume watering when the flower stalk appears. Feed them every other week while they are actively growing (spring/summer) with a diluted water soluble fertilizer. 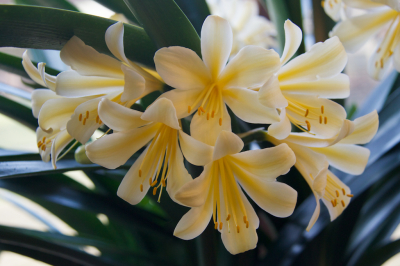 Clivia likes average home temperatures, except during its dormant period, when it needs temperatures in the 50s F. range to produce flower buds. It can get top heavy when in flower, so be sure to use a heavy pot. They are a plant that can tolerate dry conditions once they have become established and can be regarded as drought tolerant plants. Clivia rival orchids as 'must have' house plants because of the exotic appearance of their flowers. Clivia enjoy being placed outdoors during the summer. This low-maintenance vine which is also commonly called Devil's Ivy, has heart-shape leaves and can be grown as a mounding tabletop plant, in a hanging basket, or trained upright on a pole. It's not fussy about how much light it gets, but the brighter the spot, the more variegation you'll see in the leaves. Devil's ivy is one of the more versatile houseplants you can grow. It looks great trailing out of a hanging basket, climbing up a pole or other structure, or just left to crawl over a tabletop or mantel. This trailing lush, leafy vine will put up with infrequent watering and neglect. In its native tropical jungle habitat, pothos can grow extremely long, but in the home about 6 feet is more common. 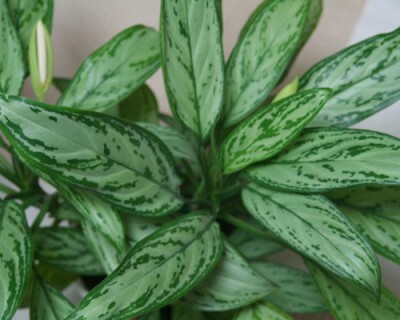 It is one of the best plants for purifying indoor air. It is great for those who don’t have an interest in gardening. It adds an inviting, homey touch. Pothos can tolerate low-light areas. A weekly watering will be adequate. Prune it for a fuller-looking, robust plant. This plant is great for eliminating formaldehyde. Consider it for your garage since car exhaust is filled with formaldehyde. Caution: Keep it out of reach of babies, dogs and cats. With its exotic looks, glossy green leaves and ability to tolerate neglect, the Zee Zee (or ZZ) plant, a tropical perennial plant from eastern Africa, is hard to kill, slow growing and ideal as an office plant or a table centerpiece. It is ideal as a very low-maintenance plant. It prefers bright, indirect light and a watering every two weeks. Caution: Keep Zee Zee plant out of reach of pets and babies. The Chinese hibiscus blooms in various bright colors including red, white, pink, yellow and orange and has a long life span when well cared for and can grow to over 8ft tall. If grown in the home it needs to be well pruned to keep it at the right size. In their native tropical environment these plants form a large shrub or small tree that gets up to 15 ft (4.5 m) tall. The toothed leaves are arranged alternately and are quite variable, but tend to be large, dark green, and shiny. Flowers may be single, semi-double or double, depending on the variety. You can expect blooms to last about 2-3 days, with a succession of blooms that last for months. Caring for a hibiscus plant is fairly easy. A sunny window will give it the light and warmth it needs to thrive. Flowering plants need plenty of light to bloom, and this tropical beauty needs more than most. Place it where it will get a few hours of direct sun every day. Changes in light can cause hibiscus to drop its flower buds. Hibiscus plants also need warmth. The flowers are glorious and huge, sometimes reaching up to 6 inches in diameter. Most are flared and have a bell shape; they may be single or double, smooth or scalloped and have a long central tube with stamens and pistils at the tip. 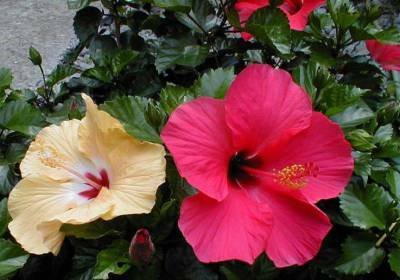 Hibiscus are native to the tropical region of Asia, and tend to grow in wet or swampy areas. The flowers of Hibiscus rosa-sinensis are edible and are used in salads in the Pacific Islands. It does not tolerate temperatures below 10°C or 50°F. These plants do best in self-watering pots which prevent the soil from drying out. Because many palms grow to a great height in tropical climates, it is important to know the plants' matured height before buying them. Grown indoors and potted correctly they will grow to approximately 3ft-8ft in height, making it a good idea to plan where the plant will reside, based on the space needed. Palm's prefer partial shade (or partial with some sunlight), especially the kentia and parlor, as they are more than happy in low-light conditions. The Chamaedorea family of palms is perhaps the best suited for general indoor growing . 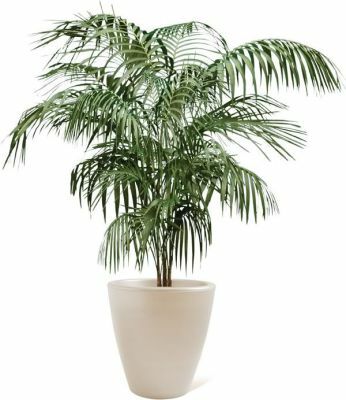 The Cataractarum Palm (often called: Cat Palm) and the Parlor Palm are the most common indoor Palms. The Bamboo Palm is popular as a taller indoor palm and grows generally to 8 feet or so. The Cat Palm grows to about 6 feet while the Parlor Palm grows to about 3 feet. They both can be grown in indirect light - so almost anywhere in a building- and are generally pretty low maintenance. The Cat Palm can tolerate more direct sun but prefers somewhat moist soil. The Bamboo Palm (Chamaedorea sefritzii), also known as the reed palm, thrives in shady indoor spaces and often produces flowers and small berries. It tops the list of plants best for filtering out both benzene and trichloroethylene. They’re also a good choice for placing around furniture that could be off-gassing formaldehyde. 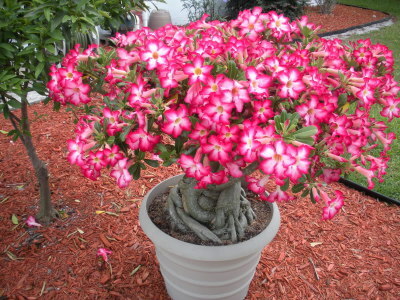 Although Adenium Desert Rose is forgiving and can tolerate many conditions it will grow best if placed in a sunny window year-round. During the summer the Desert Rose produces clusters of gorgeous pink or red flowers which grow at the tips of the stems, with a succession of blooms that lasts for months. The 'Miss Beauty' variety is known to produce especially beautiful flowers. In order to maintain frequent blooming it should be watered weekly. It should be planted in a cactus mix in order to maintain good drainage and good root aeration. This flowering succulent stores water in its swollen base, so it doesn't need watering often. Take extra care to water the potting medium only. Try not to get water on the base of the plant because the roots will start to rot and it may not recover. Be aware that this succulent shrub may drop its leaves and go dormant in the winter. Lack of light, dry soil or cold temperatures will often cause dormancy. Don't worry, it will regrow it's leaves once it gets adequate sunshine, heat and water again. Also be careful not to overpot your plant. It flowers best when it is slightly pot-bound. 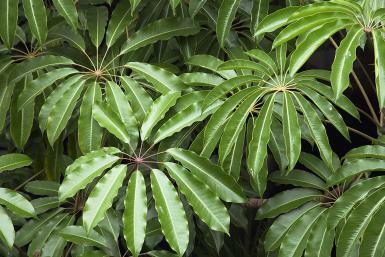 Umbrella plant will flourish if it receives plenty of water and regular fertilizing. It is great foradding impact to a corner of a room, as the height of this plant is one of its best features. It prefers indirect sunlight. 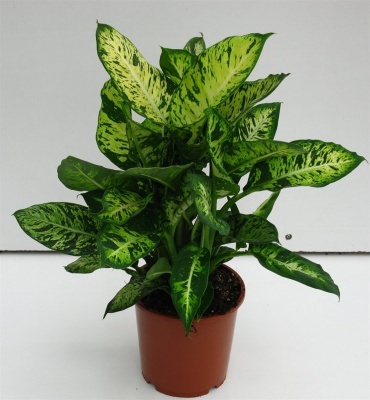 This plant loves humid environments and moist soil, so water it weekly and spray frequently. The Umbrella plant loves warm, humid conditions. Fertilize it in its growing season with liquid fertilizer or slow-release pellets. 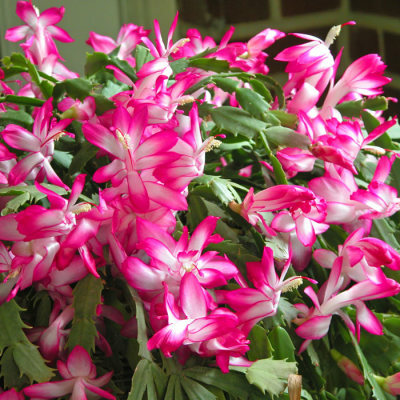 Thanksgiving cactus (Schlumbergera truncata) and Christmas cactus (S. bridgesii) are popular gift plants in fall, and you can enjoy them year after year. They bloom well if exposed to cool nights and the shorter days of early autumn. Summer them outdoors in a shady location till they bud, but bring them in before a frost. Pinching the segments once or twice in early summer encourages branching and more blooms. Water them more often than other succulents, particularly if you summer them outside. Note that all parts of this plant are poisonous. One of the plant's common names, dumb cane, comes from the effect of it's toxic sap that if eaten causes swelling and numbness in the mouth and throat if eaten or chewed by pets or children. 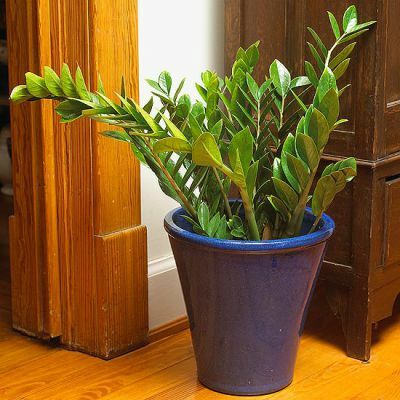 This easy-to-care-for plant can help filter out a variety of air pollutants and begins to remove more toxins as time and exposure continues. Even with low light, it will produce blooms and red berries. 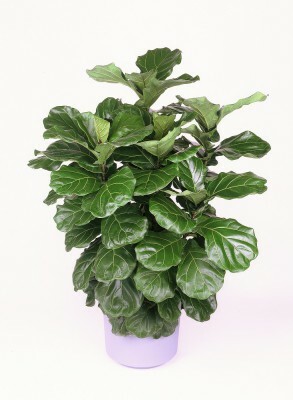 It's extra tough and has attractive leaves that brighten areas of low light. It prefers low to medium light and temperatures between 60-75 degrees F Keep the soil evenly moist. This plant will usually grow to about 3 feet tall by 3 feet wide. As a decorative element, moth orchids offer winter and spring blooms, plus they have an unusual grace, with their arching flower stalks. When they’re in bloom, you can put them anywhere in your home. It’s only when they’re out of bloom that they’re fussy about light. They do best in a north- or east-facing window in an otherwise bright room and need to be kept out of direct sun. They’re happiest in temperatures of 70 to 80 degrees Fahrenheit during the day and around 60 degrees Fahrenheit at night. They prefer high humidity which can be provided by putting them on a pebble-lined tray with water, keeping the pot above the water level, or misting the leaves regularly in the morning. Water when the roots are silver colored, the potting mix is barely damp and the pot feels light, using room-temperature, not cold, water. Let the pot drain thoroughly so the potting mix is damp - but not soaked. Feed weekly with quarter-strength liquid fertilizer. When repotting use an orchid mix or orchid bark for the best results. Note that the roots coming out of the top of the potting mix are aerial roots. They’re fine; orchids are air plants, and these are normal. To get a moth orchid to bloom again, snip off the flower spike after blooming finishes, either just under the first bloom or at the base. Wait for a second spike; either from the first one or nearby. If the plant doesn’t rebloom, then drop the temperature to about 50 degrees Fahrenheit at night. 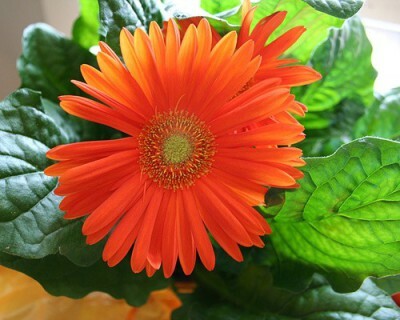 This bright, beautiful member of the daisy family is one of the most popular plants used in flower arrangements. It is effective at removing trichloroethylene, which you may bring home with your dry cleaning. It’s also good for filtering out the benzene that is found in inks. These plants prefer very bright but indirect light. Water them more often during the warmer months of the year. Always water thoroughly until you see water coming out the drainage hole. Do not allow any dry pockets to remain in the soil around the roots, which can cause the plant to wilt. Discard any water left in the saucer. Don't water again until the top 1 inch (2.5 cm) of soil is dry. Take care to avoid splashing the leaves. 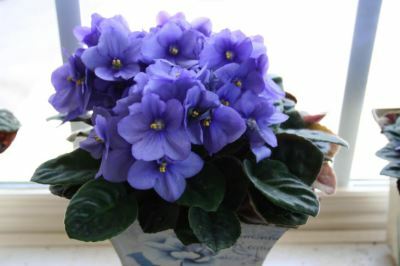 Just like African Violets, it's best to water them from the bottom, or around the sides rather than from over the leaves, as this can cause fungal diseases. Water them much less during cooler periods. 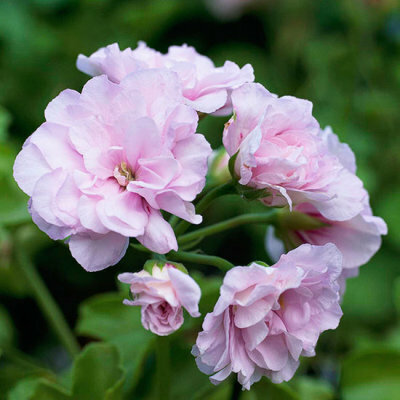 Geraniums have been a gardener's favorite for well over a century. The old-fashioned standard for beds, borders, and containers, geranium is still one of the most popular plants today. Traditional bedding types love hot weather and hold up well to dry conditions; many offer colorful foliage. Regal geraniums, also called Martha Washington, are more delicate-looking and do better in the cool conditions of spring and fall. Though most geraniums are grown as annuals, they are perennials in Zones 10-11. Bring them indoors to overwinter, if you like, then replant them outdoors in spring. Or they can bloom indoors all year long if they get enough light. They prefer full sun and usually grow between 6 inches to 3 feet. Flower colors range from Blue, Orange, Pink, Red, White. They bloom during most of the summer months, are drought tolerant, low maintenance and are deer resistant when grown outdoors. The Calamondin Tree is one of the most cold-hardy of all citrus trees and is one of the most popular citrus trees available for indoor growing. The fruit of the Calomondin Orange Tree is about the size of a tangerine and has a thinner skin than most oranges. Fruit is yellow-orange to orange. It is is usually used in marmalades, baked dishes, juices, in preserves, and as a complement to seafood, meats, and sauces. It is also delicious eaten in its raw form. Pick the fruit when it is half-ripe and let it ripen off the vine. This tree can bloom all year long, but most fruiting takes place between June and November. Typically, blossoms and fruit form after the tree is two years old. This citrus tree prefers bright sunlight, so be sure to put it in front of a sunny window. Leave it outside on a patio during warm months and only bring it inside once the temperatures dip below 50 degrees F. Allow the top one-inch of soil to dry out completely between watering times. Feed sparingly, about every five weeks, with a citrus fertilizer during winter months. 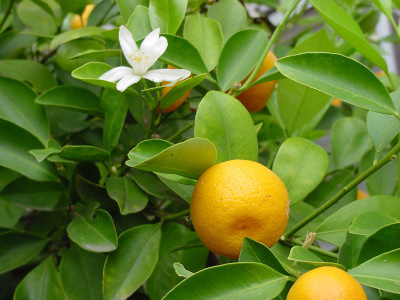 This tree will eventually blossom and fill your home with a delightful citrus scent.